Katharine T. Carter & Associates dispels the myth that artists compromise integrity by obtaining assistance and support in their career development and promotion. In truth, these services can catapult a mid-career artist into the kind of success that enables them to focus solely on the production and quality of the work. One-on-One Career Development Consultations by President and CEO Katharine T. Carter, offering artists an opportunity to learn marketing strategies and obtain valuable resources of information so they can achieve similar results to the Company’s higher level services based on their own initiative. In-studio consultations and critical analysis by New York City/Los Angeles critics and independent curators (our senior Associates). Professionally produced written support materials for artists, including New York critic’s essay, petite essay, artist statement, promotional cover letters, biographical summary, press and media releases, and 30-60 second radio and TV spots, and museum wall text. Public Relations and Promotional Services surrounding exhibitions organized by Katharine T. Carter & Associates. 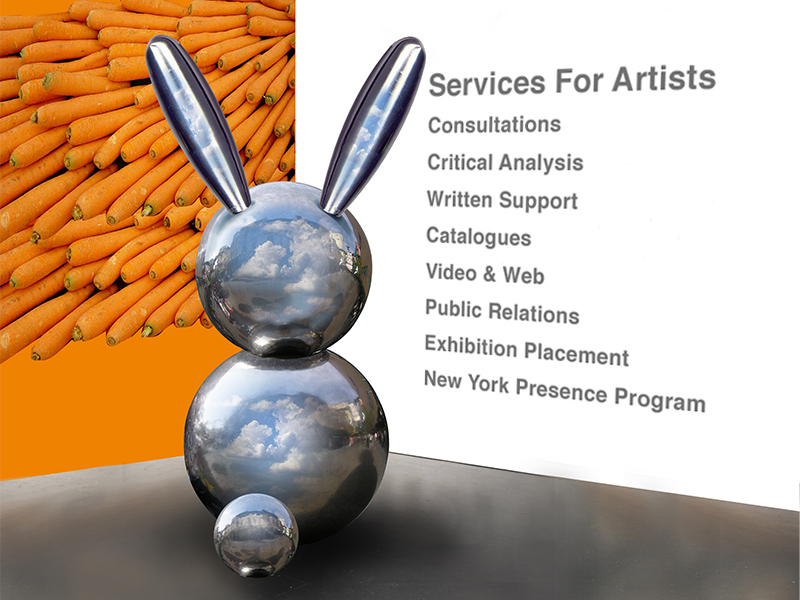 Exhibition Placement Services for mid-career artists participating in higher level contractual services. The New York Presence Program for Visual Artists is a referral program independently available through Robert Curcio of curcioprojects, designed to give artists access to the kinds of opportunities an independent New York City curator or freelance agent typically hears about. Questions about the mission of the Company exist because artists and art professionals both in the commercial and the not-for-profit sectors are unfamiliar with the procedures and costs surrounding public relations and promotion. The average cost to hire a public relations professional or firm in New York City runs between $3,000-$5,000 per month. Katharine T. Carter & Associates offers artists comparable services at a fraction of the cost – and it’s exclusively for artists. Public relations, marketing and promotions is a service, and these services are fee-based. The role of the curator or commercial gallery dealer is often confused with the role of public relations professionals. Unlike the gallery dealer, we do not represent artists –– our professional services are “retained“ by artists; however, both the work and the professionalism of the artist are carefully screened by the Company and its distinguished Associates. Katharine T. Carter & Associates does not take a percentage on sales resulting from either a gallery or museum exhibition organized by the Company. Katharine T. Carter has gathered together some of the most respected names in the business to work together as her Associates. They have offered their talents and resources because they believe in the concept of the Company and wish to help artists in a positive and tangible way. Both museums and galleries are changing their structure and the amount of responsibility which must be assumed by the artist –– the Company is preparing the artist for this new role. The Exhibition Placement Services are the cornerstone of the Company; the not-for-profit sector is shifting operational and funding paradigms to insure their own survival. Katharine T. Carter & Associates has responded by offering rental free exhibitions to non-profit institutions nationwide, accompanied by 200 complimentary catalogues with essays by leading art critics, 1000 color announcement cards, and pre-written press materials. Katharine T. Carter is pleased to offer the services of her Associates, a unique group of individuals with extensive experience in all aspects of the art world. These art professionals are available for a wide range of individualized programs, dynamic lectures, workshops, symposia and group weekends to New York. Katharine T. Carter, President and CEO, a nationally recognized artists’ advisor, lecturer, and painter, has assisted thousands of artists who have attended her Professional Development Workshop and Seminar series. Ms. Carter is also the founder of the highly successful lecture series The Highlights of the New York Art Season which, along with the Professional Development Workshop and Seminar series, has been hosted by over 200 museums, colleges, and art organizations since 1985. In 2010, Katharine T. Carter in collaboration with her Associates and Running Hare Press published a large format reference book titled Accelerating on the Curves: The Artist’s Roadmap to Success. The book was featured in the February, 2011 issue of Art in America, and reviewed in publications including Sculpture Magazine, Resolve 40, FAME NY, Chicago Art and numerous other outlets. Upcoming reviews include ARTnews, dArt International, Artist Magazine, American Craft and Ceramic Review. The second edition, expanded and revised, of Accelerating on the Curves: The Artist’s Roadmap to Success was released in 2016. Carter now devotes her time fully to furthering the careers of artists across the country, and working with institutions, galleries, and critics to create synergistic and interdependent solutions for success in today’s contemporary art world. She has booked over 1,000 one-person exhibitions for her clients at museums, art centers and better college and university galleries.